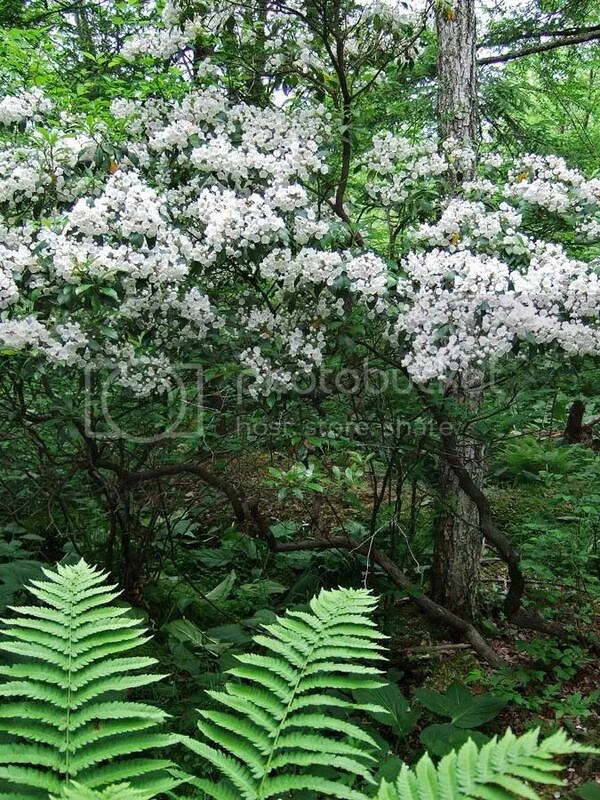 The Mountain Laurels are starting to bloom in Pennsylvania. This is our state flower, and its emergence marks the point where our climate finally evolves from the fickle whims of April and May, to the soft summer weather of June. It is a moment of unconscious celebration for people who begin to open their pools, grill in the evening after work, and sit on the porches at night, listening to the distant call of whippoorwill. 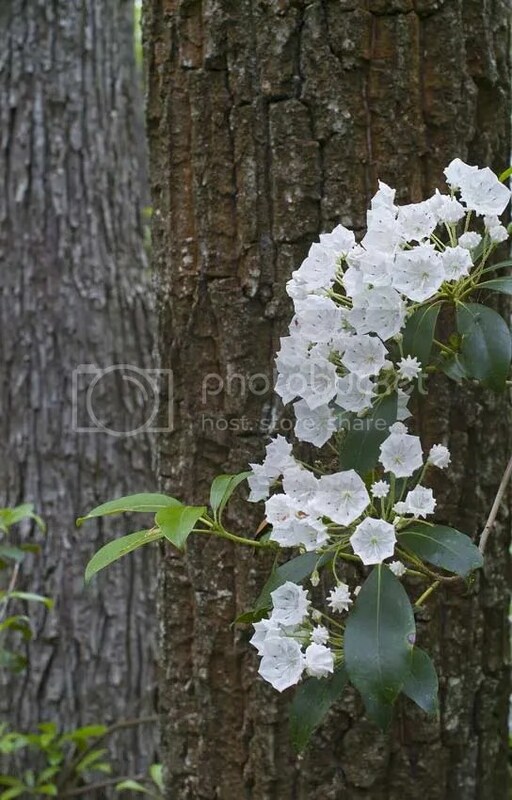 Here in the northeastern part of the state, we are beginning to see the delicate clusters of white blooms open up on the lower altitude woodland slopes in our region. 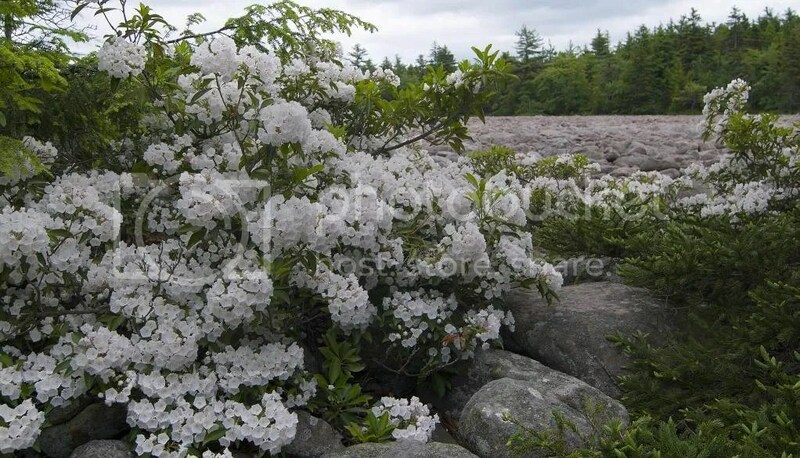 By mid to late June they will bloom in abundance throughout the northern third of the commonwealth. I have for the last fifteen years, taken a week of vacation at this time, to wander the mountains, either by backpacking, or more recently, because of the burgeoning weight of my photo equipment, and a bad knee, car camping and day hiking. The laurels, and their cousins, wild rhododendrons, provide the forests their last splash of widespread color before they settle in to the monotonous green of summer. Arguably, it is the last time until fall, for a photographer to use wider lenses in the forest. After the laurels are extinguished, longer focal lengths become more useful to capture the later blooming wildflowers which are scattered throughout the woodland greenery. I first hiked the West Rim Trail of north central Pennsylvania in mid June, perhaps eighteen years ago. I was mainly a mountain biker at the time and hadn’t backpacked in years. I didn’t realize at the time, the different conditioning needed to carry a pack over distance. The rugged trail, plus the weight on my back played hell with my feet. The weather had been wet, and I remember being extremely eager for the trip to end. I was getting close on the third day. The last portion of the trail diverts west into the Tioga State Forest, apparently to avoid Coulton Point State Park which hugs the rim of the” Grand Canyon of Pennsylvania” in that location. Within the last four miles of its northern terminus, the trail leaves the woods to once again skirt the edge of the gorge. The Pine River gorge at this point is roughly 800 feet above the river, and the edges are swathed in laurel, which was in full bloom as I emerged from the forest on the path as it swerved to edge of the ridge. My jaw dropped at the beauty. White blossoms were everywhere, densely surrounding the trail. To my right was the spectacular vista off the ridge. I photographed it at the time but the small pocket camera and I were inadequate to the task, and the results were unpublishable. The memory of this, however, was worth every blister. A year later, I was on the Loyalsock Trail in the Wyoming State forest. This is a very vertical trail, laid out I am told by an Explorer troop, which must have had very sadistic leadership. I was in better shape that year and enjoying as I recall some wonderful June weather with blue skies, seventy degree days, and fifty degree nights. Hiking with several friends, we lugged our heavy backpacks up another of the seemingly limitless up hill climbs that mark the trail’s early miles. I remember cresting a hill, and looking down on a relatively old growth stand of trees on the vast wooded slope below. The canopy was quite high, perhaps 150 feet. There was a feeling of being in a vast verdant space. The forest floor was lush with white laurels, all in full bloom, a carpet that extended for as far as your eyes could discern. All of this was dappled with shafts of sunlight, occurring at random spots where the leaf cover was spare. No one could help but to stop, and stare. Though it was only 11 AM, we found a log on which to sit, and ate our lunch early. June is a wonderful time of year in the eastern mountains. Perhaps God makes the Mountain Laurels bloom, just to remind us. This entry was posted in Environment, Photography, Uncategorized and tagged Eastern Forests, Environment, Fujifilm, Henry F.Smith Jr, Pennsylvania, Pennsylvania photography, Photography. Bookmark the permalink.